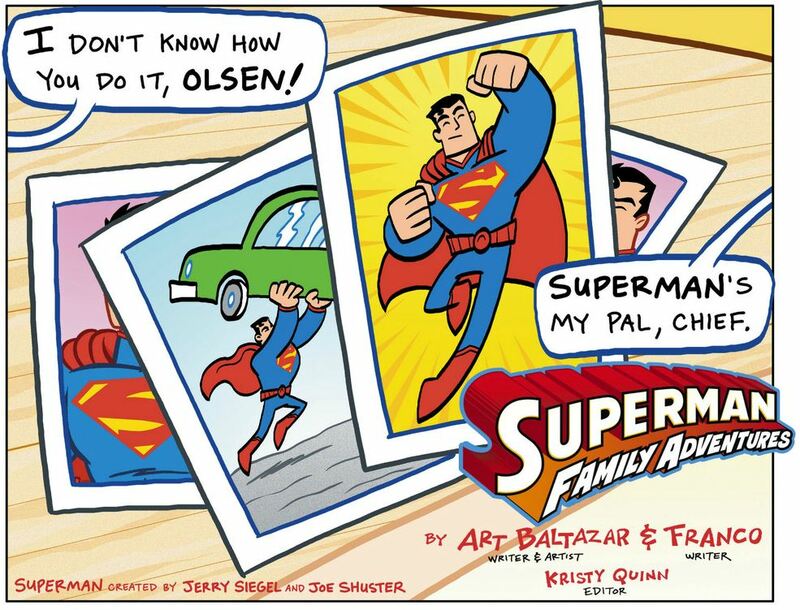 Superman Family Adventures is the newest series from the creators of Tiny Titans, Art Baltazar and Franco Aureliani. With special apperances from the Tiny Titans and the Super-Pets, this is a great series for kids. In Superman Family Adventures #3, Jimmy Olsen accidentally calls the Super-Pets for help and Superman pulls a few fast ones on Lois Lane. Jimmy Olsen’s story is the first up and it’s pretty funny. While bragging to his friends about knowing Superman, he uses his special watch to prove it. Instead of getting Superman, Beppo the Monkey from the Super-Pets shows up. His friends all get a good laugh, while Jimmy tries to figure out what went wrong. After a series of funny events, we get to see the entire Super-Pets team come in to save the day. There’s also a short skit with Krypto and Fuzzy, which explains why Superman’s suit has changed in the New 52. Later, Clark tries to throw Lois off his trail of being Superman and calls for code “Pink.” Superboy and Supergirl both inadvertently send a Superman robot to Clark’s position to throw Lois off his scent. The end result is pretty funny. This is one of the comic books I love to read when I’m having a rough day at work. It’s light, funny and has all of my favorite Superman characters. My son can read it on his own and enjoys sneaking it under the covers to read at night when he is supposed to be asleep. The special appearances by the Tiny Titans and Super Pets make me feel like their story never really ended, it just got bigger in Superman Family Adventures . You can purchase Superman Family Adventures on Comixology or check your local comic book store. I highly recommend this series for any age. 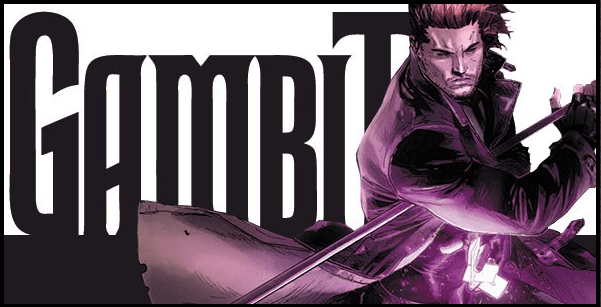 Everyone’s favorite Cajun mutant is back in his own ongoing series in Gambit #1 . Gambit is determined to get back to his thieving roots, looking for a break from the responsibilities of being a teacher and a “sympathetic ex-boyfriend.” (The phone showing a text from Rogue is a nice detail.) Gambit plans to infiltrate the home of a suspected bankroller for the bad guys, who is rumored to keep their weapons and artifacts as a payment for failure. It might just be a result of seeing Gambit in a tux for most of the issue, but this opening story is reminiscent of a James Bond movie. The action and intrigue are worthy of any big budget spy flick. And ladies, if you’ve been looking for your own comic book eye candy, this issue opens with Remy LeBeau starting his inner monologue in the shower. There’s no big bad superpowered villain to fight in this issue, and that’s just fine — the suspense of Gambit’s job is more than enough to make this an entertaining read. I always love taking a look at first issues in a series, but only a very few interest me enough to buy the next issue. Gambit #1 does just that, though, and I’ll be back for more. 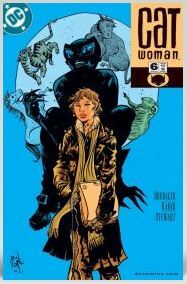 Issue 6 of Catwoman focuses on Holly and her stresses — her new, clean life of working as Selina’s eyes and ears on the street thrusts her back into the gritty milieu of crime and temptation from her own days living on the street. Our experience of her point of view is partially told through “junkie vision” as she interprets every action and person on the street through her street-wise eyes. She visits a friend and has to decide whether to confide her new role as an intelligence-gatherer on the side of justice, if not quite law and order. Her situation complicates further when an informant brings news of the dealer she’s seeking and she has to follow him on her own. In this issue we learn more about Holly and how she thinks and the past that formed her. The current story line of children and drug running is advanced without an obvious intervention from Catwoman. 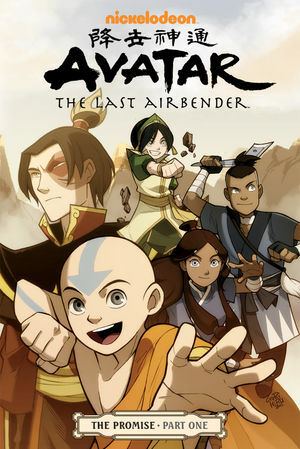 Although The Legend of Korra was a great way to get back into the TV universe of The Last Airbender, my kids and I still missed our beloved characters from the original series. Enter comics! The Promise is written by Gene Luen Yang, who created American Born Chinese , one of my all-time favorite graphic novels. It starts right where we left our heroes; the problems don’t stop just because you saved the world. The Fire nation still occupies many territories, but simply telling the people to move out creates new problems (a great place to start a discussion with your children about real-world issues like this). Zuko is having a hard time fitting into his new role and actual turns to his jailed father for advice (?!). Meanwhile, Toph is struggling to start her metal-bending school, and relationship issues are creeping up with everyone. Part One and Part Two of this new “Season Four” of The Last Airbender has everything we loved about the TV series: unique characters, silly humor, and complex plots! We can’t wait for Part Three that comes out this Fall.